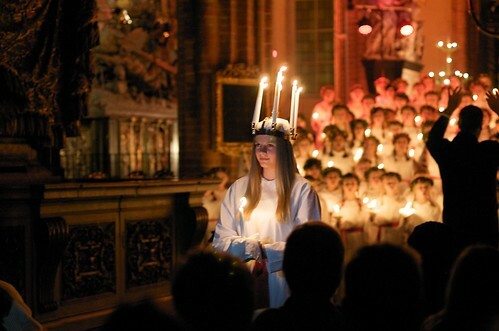 I shall never forget my first Lucia in Sweden. In Stockholm on my own for job interviews, I was startled by the darkness and cold. New friends took me to the Christmas market on Gamla Stan, where we warmed ourselves with glögg and roasted almonds. We then went to the Lucia concert at Storkyrkan. The beautiful music and candlelight reflecting off the red brick walls of the old church transported me to another place, far from the cold, dark city. It was magical and inspiring. Twelve winters after that snowy Stockholm night, I found myself singing the same songs of the season, in the Predigerkirche in Zürich. Tonight was the dress rehearsal for Nota Bene’s annual Christmas Concert in two days. I fell like I have come full circle. Come Wednesday night, I hope that my voice may, like Lucia, cast light into the darkness—and perhaps lift the spirit of a lonely traveler far from home.